Fries come in all shapes and sizes. Which is your favorite? The cross-cut? Big steak fries? I like the shoestring. These lovely buggers have more surface area which is where I know the flavor lies! Salt, oil and of course, potatoes. Use a mandolin to make the slicing easier. 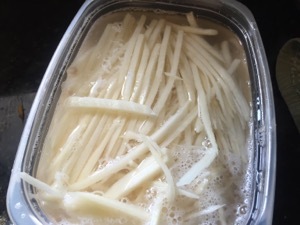 Once sliced, soak the fries in water. This removes some of the starch and allows the fries to cook better. Heat about 2-inches of oil in a large, heavy bottomed pot over medium heat (or in a deep fryer heat oil at an appropriate depth) until a deep-fry thermometer reads 325 degrees F. Line a pan with paper towels. 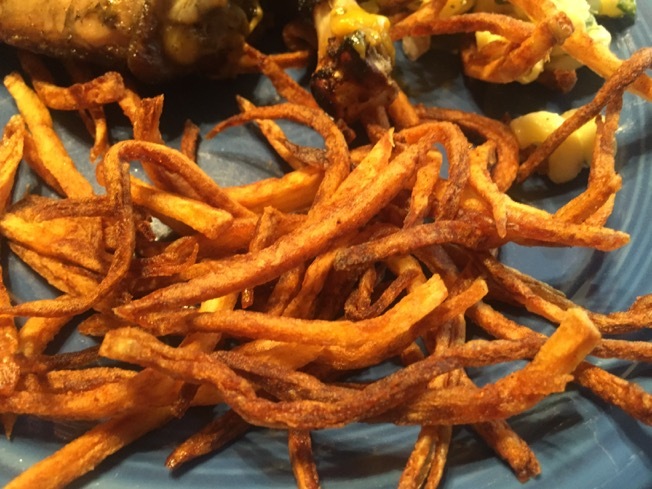 While the oil heats slice the potatoes into shoestring fries with the thin julienne attachment of a hand-held mandolin or vegetable slicer. Place potatoes in a bowl and cover with tepid water for 10 minutes. Spin them as dry as possible in a salad spinner. Spread them on towels, and blot with more towels. You want the potatoes bone dry so that they don’t spatter in the hot oil. 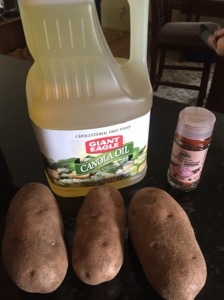 Increase the heat to medium-high, and working in batches, carefully add the potatoes to the oil and fry about 4 minutes. They won’t yet be turning brown but will be somewhat done. Scoop the fries from the oil with a slotted spoon, and drain on the prepared pan. Once all the batches have been in and out of the oil, increase oil temperature to 375. 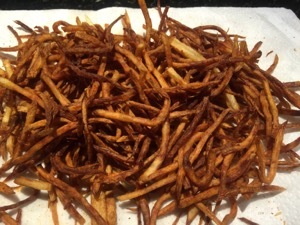 Pat fries dry with paper towels (beware of the hot oil) and after cooling for 2-3 minutes, put fries back into hotter oil in batches. Cook for 3 minutes until nice and brown. I could live off of fries!